On the last day of our trip to Vietnam we had few hours to spare before our flight to Singapore in the evening. 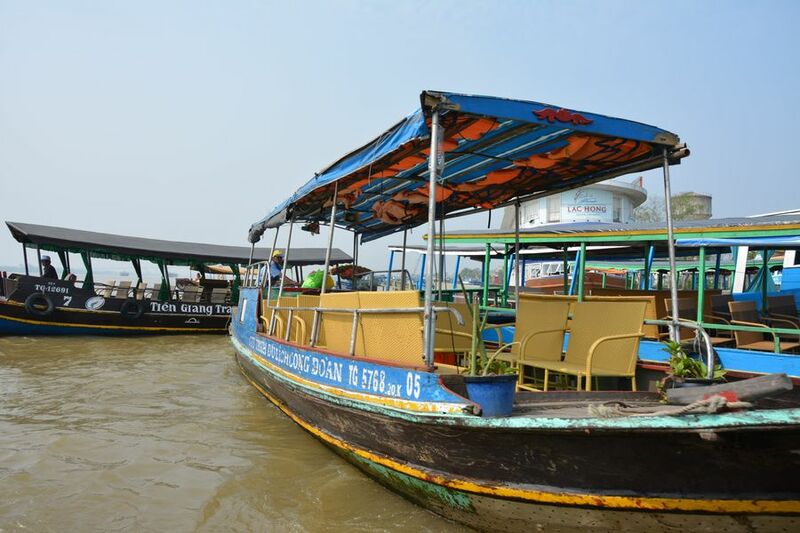 We decided that a visit to Vietnam won’t be complete without taking a slow boat ride along the Mekong River. 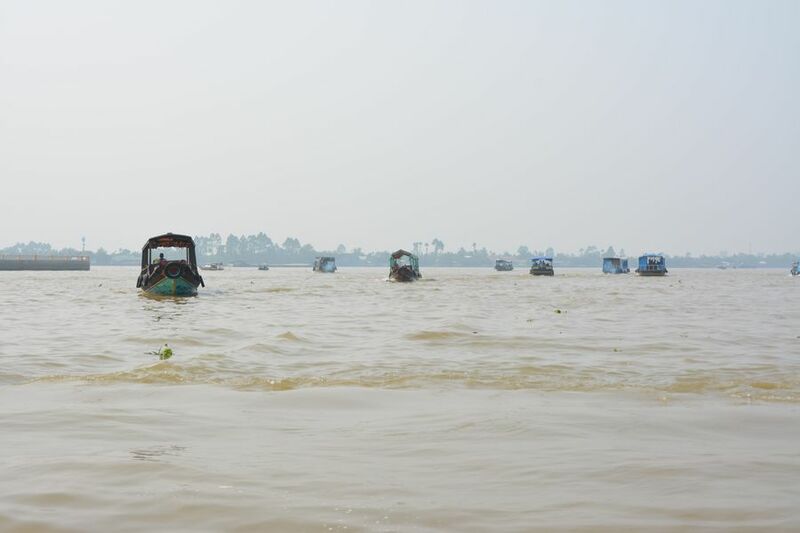 Some quick facts: Mekong is the 7th-longest river in Asia with estimated length of 4350 kilometers. 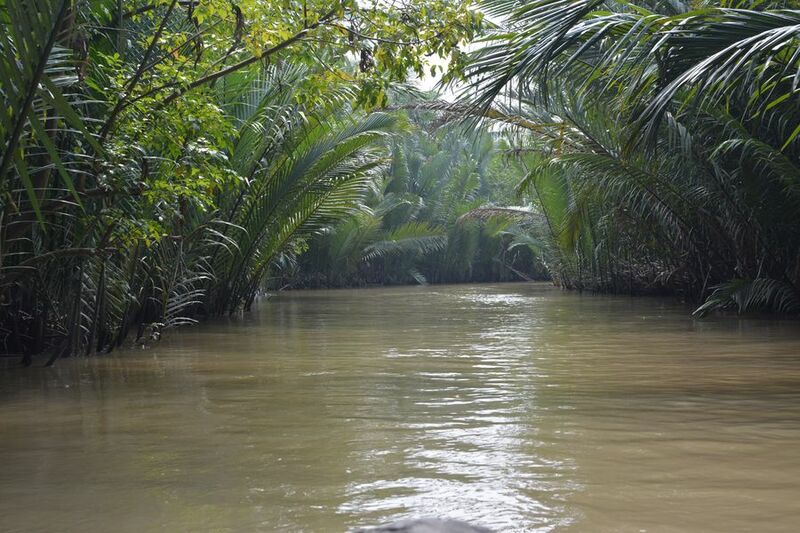 The river runs from the Tibetan Plateau through China, Burma, Laos, Thailand, Cambodia and Vietnam. 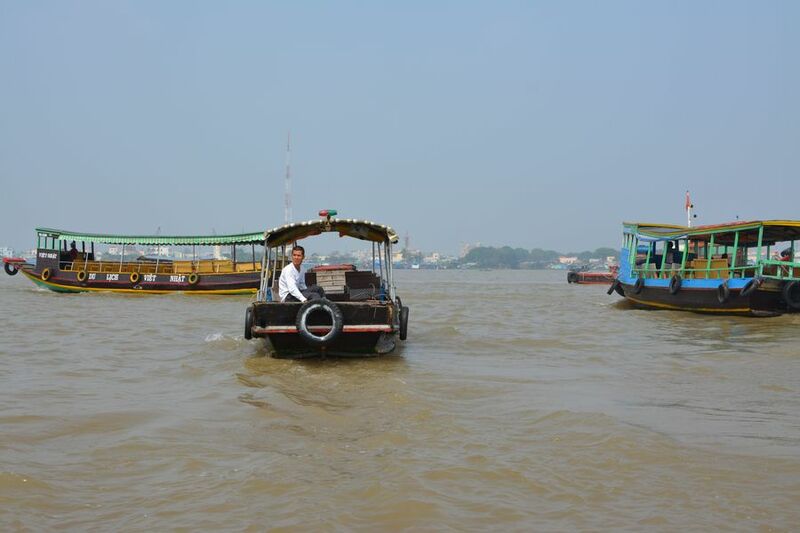 All year round the color of the river is similar to the light brown colored coffee with milk. 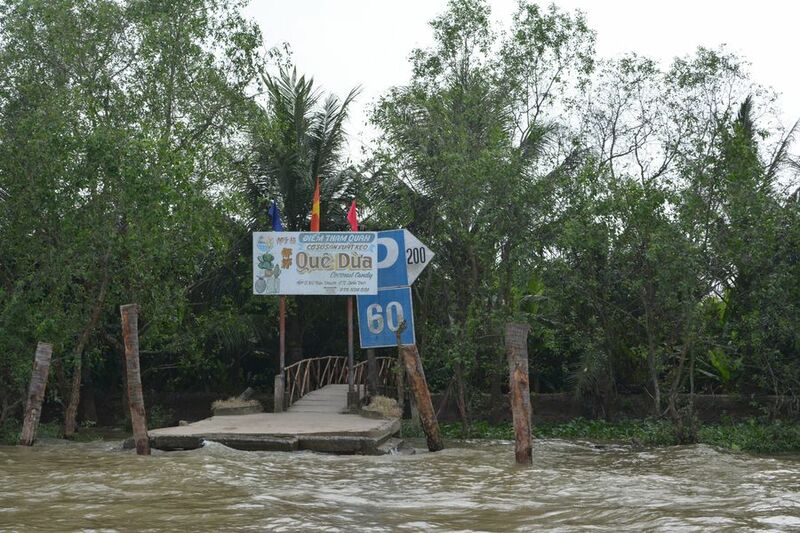 Instead of travelling with the motorbike we rent, we decided to participate in one day tour of the Mekong Delta. We bought it from Vietnamtravel’s tourist agency situated in District 1. There is no big difference in the offers given by the various agents along the street. 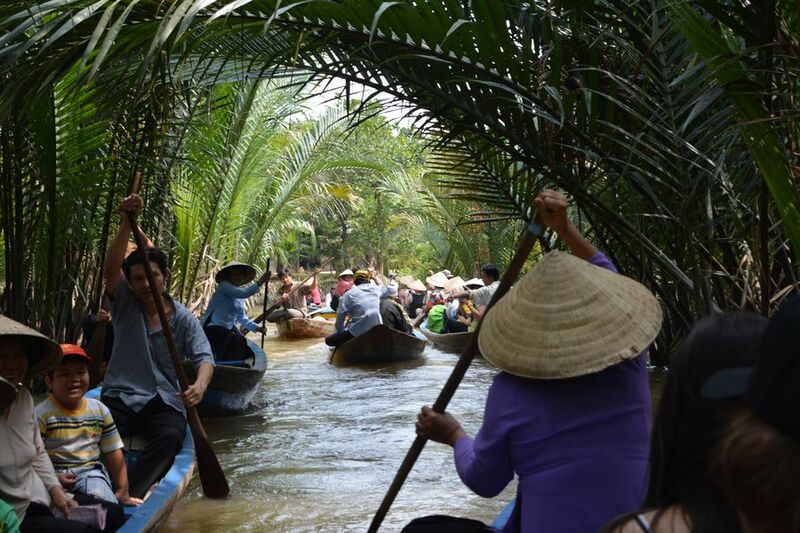 The price vary from $6 to $10 per person for the one day tour and includes a bottle of water, transportation with minibus, sample of the local tea and honey, tour to the Coconut island, lunch and two trips along the Mekong. The brave Lone who invited us to give it a hand, but nobody was up for it. After a quick two hour ride from Ho Chi Minh to My Tho we boarded a big boat that featured the ultra comfortable wicker furniture, more appropriate for a garden or a backyard. During the trip we were entertained by the various odd objects that were floating in the dark waters of the river. We spotted various bottles, rich vegetation and coconuts and almost managed to find a matching pair of slippers. Enthusiastic locals are awaiting for the next batch of tourists to come. On the island we were shown the biggest pride of the locals – a beehive. The tour guide (a cheerful coin collector named Lone) was posing bravely with the bees and was inviting us to give it a hand. It seemed that our group wasn’t composed by a brave and adventurous persons and we quickly skipped to the tea sampling. Some pretty heavy traffic ahead. The delicious chamomile tea was mixed with the local honey and some bitter lime. We were treated with delicious sweets, like the dried ginger with sugar, banana chips and nuts with honey. Time to visit the Coconut island. 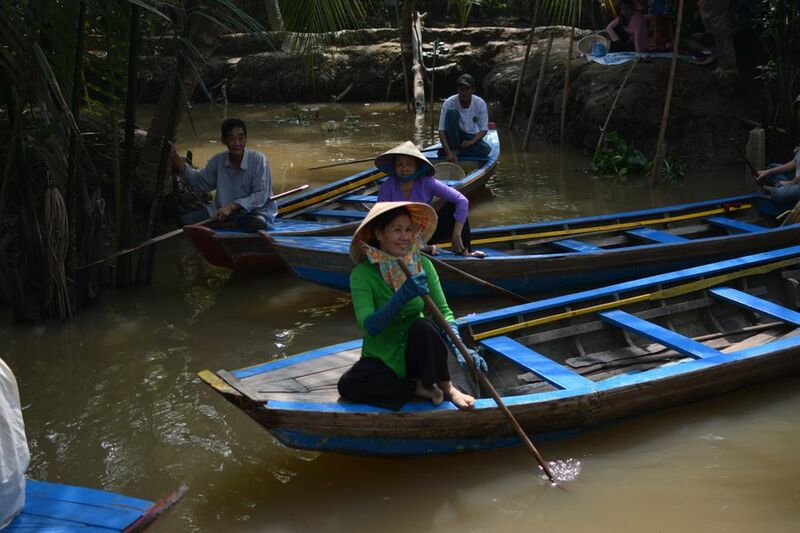 After the refreshing tea session we hopped onto small wooden boats, that fitted up to six people and we were transported back in time while making our way through one of the various river canals. The water was even darker here and there was a very strong odor. Most probably the waste waters from the local houses were pouring into the canal as well. The river path was overcrowded with people and empty boats that were going back to take the next portion of curious tourists. The second canal which was also fascinating, even without all the bustling from the local boats. We swap boats and once again found ourselves travelling with big one, equipped with car engine and a steering wheel. We embarked on a journey through a different and bigger, but unfortunately as smelly, as the first one, canal. There weren’t any animals or birds at sight and around five minutes later we anchored at a small dock at the Coconut island. Welcome to the production line at the Coconut island. The island got its name due to the endless fields planted with nothing else than coconut palm trees. 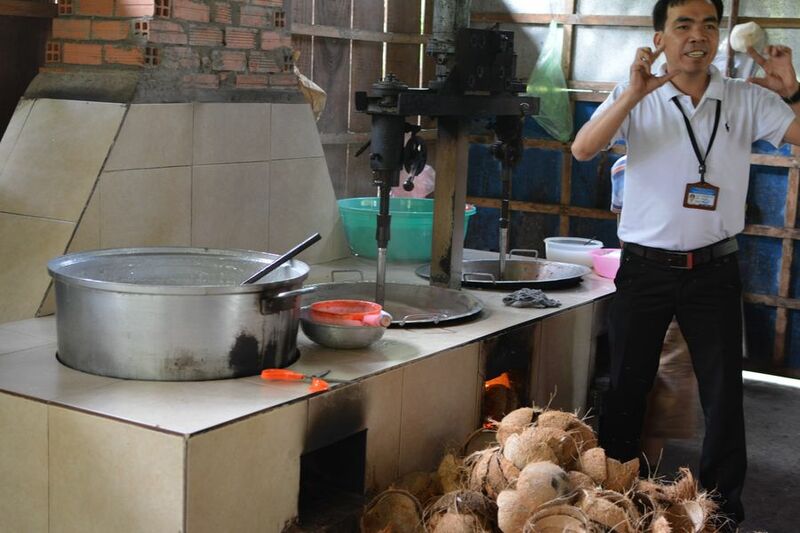 There was a huge factory which we didn’t managed to see, but we were brought to a local house, to witness the production of the Vietnam’s exclusive coconut candies, Hot it’s made style. The smell was really pleasant and there were tons of the candies for sale. As the tour guide said, we won’t be able to find these candies anywhere in Vietnam, I found it hard to believe. (We did find the same type of candies in the duty free shop). 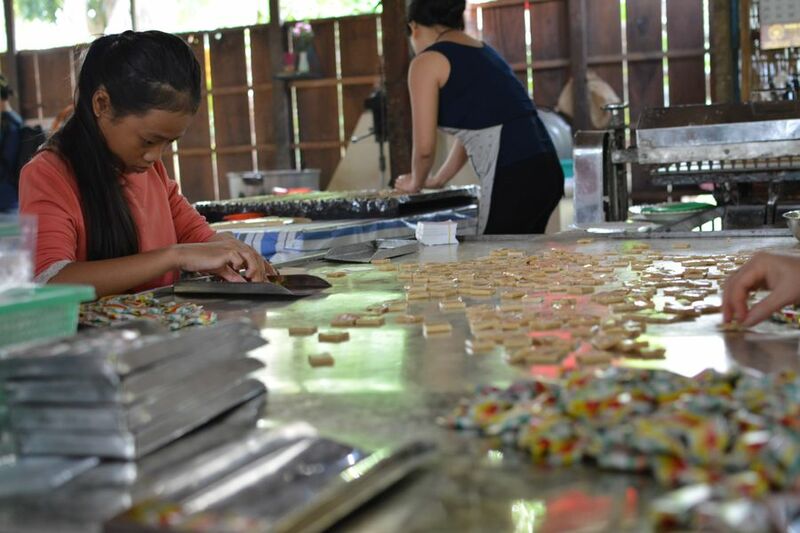 Each coconut candy is hand wrapped in paper and then carefully places in the bag. Our tour ended with simple lunch that consisted of sticky rise and fried pork meat. We were greeted by a water buffalo and bitten by few mosquitoes before we boarded the big boat that led us back to the mainland of My Tho.